You can also email us your vehicles registation number (UK only) or vehicle details for international customers, we can then use our extensive up-to-date parts database to confirm which part is the correct one. High Reliability - The bypass passage structure significantly reduces contaminations to the sensing element, improving reliability. DENSO’s sensing element with a fine platinum wire is coated with a glass film to protect the platinum wire, resulting in even higher reliability. Small size and light weight - The small bypass passage structure and control circuit significantly reduce the size and weight of the air flow meter. The control circuit is integrated with the top of the air flow meter so that only the small bypass passage structure with the sensing element is inserted into the intake air pipe, resulting in minimized pressure drop of the air flowing in the intake air pipe. High detection accuracy - The uniquely designed bypass passage prevents the adverse effect of air turning toward the sensing element, as well as errors caused by air pulsations produced in the intake air pipe, resulting in higher detection accuracy. Easy installation -The air flow meter can be installed by inserting only the small bypass passage structure with the sensing element. That means the air flow meter can be used in a wide variety of air systems. 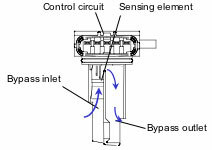 The sensors element position within the bypass passage helps reduce contamination, improving reliability. Conventional air flow sensor elements are an open subject to dust and dirt, reducing reliability.